Something to look forward to: Rockstar’s highly anticipated and long-awaited horse opera Red Dead Redemption 2 launches tomorrow. However, the embargo for reviews was lifted this morning. If you want a full rundown, you can read our republication of Kotaku’s review. In the meantime, we've rounded up an almost spoiler-free selection of several other takes. Based on early reviews, Red Dead Redemption 2 is looking like a pretty solid title. Aside from a few fairly tolerable annoyances, critics found the game mostly enjoyable and stunning. Graphically it's like a piece of art. The story is troubling in that being a prequel we know the fate of the gang. The environment, characters, and interactions are convincing and real, even though detailed animations cause some sluggishness in controls. Devs added plenty of customization features including a variety of weapons to make players feel like they have their own unique character. It all rounds out to a fun 50-hour romp through the early American South. Dave Thier with Forbes says the one thing that Red Dead Redemption suffers from is that we already know how the story ends (possible spoiler if you have not played the previous RDR). The game suffers from the prequel problem, a common malady in the expanded universe age but particularly keen here. We know how this all ends, and it does not end well. The gang does not escape to freedom; the big score does not buy our heroes wide open pastures and peaceful lives. We have known how this ends for eight years now: John Marston hunts down and kills the last surviving members of his broken gang, and Dutch Van Der Linde hurls himself off a cliff rather than face his fate. It's rough. But while this does not have to define the game, the writing does nothing to combat it. If anything, Red Dead Redemption 2 picks out those dark threads from Red Dead Redemption and pursues them wholeheartedly by sending us down a long, brutal road with an all-but-certain ending. That funereal tone permeates much of the game, but this is not to say there isn't wonder to be had while pursuing the game's main story. There is most certainly wonder to be had. Variety’s Arthur Gies described the game as a quadruple-A title and was amazed with with visuals, but that the controls can be a bit sluggish. Rockstar makes an incredible first impression with “Red Dead Redemption 2” in terms of ambition and execution. It is one of the most visually stunning environments ever executed in a video game, and that’s not a statement spoken with hyperbole. It’s a technical tour de force, establishing its bona fides as its characters drive new obvious paths through snow and mud, as light filters through an atmosphere that effectively depicts the enormous scale of its environments. Its characters are incredibly detailed and animated, painstakingly executed in a way that brings to mind the big-budget console exclusives companies like Sony and Microsoft use to sell their own hardware. You can see the muscles work under the velvet-y skin of a horse. These sound like exaggerations. These sound like superlatives. They’re just facts. “Red Dead Redemption 2” is the rare example of a game that looks like someone threw money and bodies at the problem of a believable Wild West tableau for five to seven years while retaining a genuine vision. We can avoid the discussions of whether or not video games are art, but in many regards, “Red Dead Redemption 2’s” visual presentation almost always appears to have been executed like a painting from the late 19th century, rather than a modern piece of popular film. It is dramatic and distinctive. I’d be lying though if I said those early impressions remain consistent. I was quickly struck by less favorable observations. “Red Dead Redemption’s 2” fundamentals are, to be blunt, some of the weakest parts of its package. The way Morgan responds to controller input is sluggish, literally; there’s a tangible delay in when a button is pressed and when something happens on screen. Animation takes a priority, and I often felt stuck waiting for an action to play out for far too long, especially during points of interaction with various elements of the game world, like getting on a stagecoach. If I boarded on the “wrong” side, I’d have to wait for my character to slowly walk around and climb aboard. Chris Plante’s review in Polygon gripes a bit about the slow lead-in to the real action using food similes. Red Dead Redemption 2 takes its sweet country time getting to the heists. Before you rob a bank, you must learn to care for your health, gang, horse, camp and grooming. None of this is particularly tedious, some of it is quite fun, but most of it plays out like eating vegetables before the red meat is served. And I love veggies, but every sight and sound is hyping the main course. Stagecoaches, trains and camp upgrades allow for Arthur to travel large swaths of land, but riding to the train, then from the train to my destination, often felt just as laborious as taking the straight shot on horseback. Rockstar’s developers have designed a stunning, elevated take on the rural United States’ natural beauties, and they’ll be damned if you don’t see most of it trotting from point A to B and back again. Once Arthur learns how to be a functioning grown-up, after six or so hours, the game (and the world) loosens up. He spends the thrust of each day making money and trouble in pursuit of the grand escape to somewhere better, though whether that’s back in the West or outside the States depends on the people with whom he’s conspiring. We knew that Red Dead Redemption would be a sprawling open world. We also knew that Rockstar went to great lengths to make the NPCs more believable, but how much more believable are they? The Verge reviewer Andrew Webster was bold enough to say it is the most convincing open-world game ever. It’s the smaller details that set this open-world Western apart. In a lot of ways, RDR2 doesn’t actually stray too far from the formula laid down by developer Rockstar with games like Grand Theft Auto V and the original Red Dead Redemption. It still takes place in a vast, sprawling world, and it still tasks you with committing a lot of crimes in that world in order to progress. There are lots of shootouts and chase sequences, and you’ll kill a lot of police officers. Speaking of beards growing, the customization of your character, Arthur Morgan, is pretty broad according to Patrick Shanley with The Hollywood Reporter. There is also plenty to do and see. There is a staggering level of customization available in the game, from Morgan's wardrobe to his hairstyle to his weaponry. Guns can be upgraded with improved sights and barrels, but also cosmetically with engravings or new stocks. Morgan's horses can similarly be outfitted to the player's liking, be it their mane, their saddle or their stirrups. The depth of the game's content borders on the inconceivable. There is so much to do and see in Red Dead Redemption 2 that at times it can feel overwhelming and while other recent open world games also boast large maps and numerous side quests, none are able to offer the diversity and entertainment value that Rockstar has stockpiled into its Western opus. Finally, Mashable’s Adam Rosenberg notes that unlike its predecessor, choices you make in Red Dead Redemption 2 have consequences. Good and bad behavior also earns you a reputation wherever you go. As you commit crimes in a particular area, the bounty on your head grows, which in turn makes it harder to get around and manage your resources — shops close their doors to you, paid stagecoach rides (a form of fast-travel) won't welcome you, and bounty hunters appear intermittently to collect the price on your head. 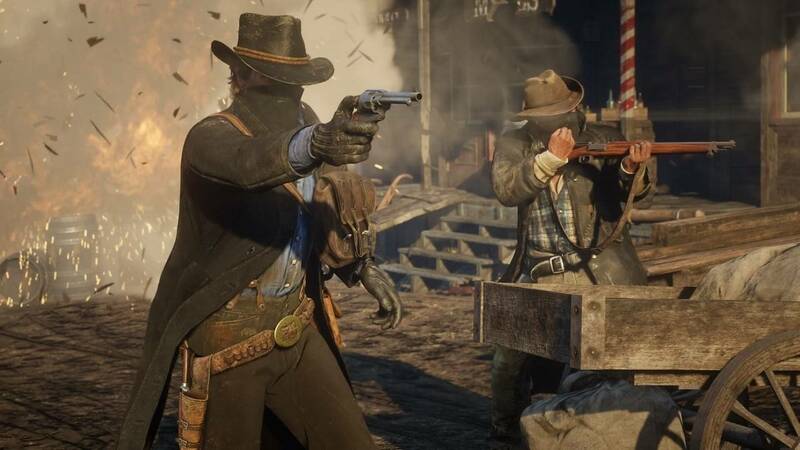 I played Arthur as a mostly good dude, and I tended to see big payouts from bounty hunting activities — you're not the only one out there committing crimes, after all. Rockstar's review documentation suggests that dishonorable behavior carries effects of its own, such as more money earned from petty larceny. I only saw one ending, but there are apparently four in total, influenced by the choices you make. Your good and bad behavior is tracked on a visible morality meter, defined as "Honor." Starting fights, committing crimes, and gunning down innocents swings Arthur toward the red, dishonorable end of the meter, while refusing payment for good deeds done and helping people in need edges it into honorable territory. Early reviews have mostly been positive as you can see. A slow beginning, prequel syndrome, and sluggish controls seemed to be the only substantive complaints so far. No reviewers have reported problems with any bugs, which is a good sign, but we’ll have to wait until millions of players start doing weird things with the game starting tonight at midnight Eastern time. Don't forget to check out the Kotaku review if you are looking for a little bit deeper dive.